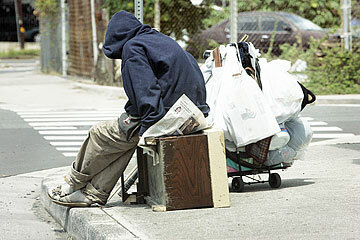 Homeless in Hawaii: How many? DOZENS of volunteers, homeless individuals and homeless service provider staff took to the streets, parks and beaches, looked under the brush and at the city bus stops, and scavenged around any other accessible place last Sunday night in an attempt to perform an accurate count of how many individuals are living homeless and unsheltered on Oahu. Those on the neighbor islands performed a similar task. Coupled with the numbers they gathered through this physical enumeration, a tabulation of individuals now living at emergency and transitional homeless shelters was also performed. When all the data are culled together, the total unsheltered and sheltered populations will then be added and subsequently referred to as the homeless point-in-time count. That number will get used and abused by politicians, advocates and the media until the next count -- with few people really understanding how to interpret the number. For starters, the number is only a one-moment snapshot estimate of homelessness. Any day, or hour for that matter, will produce a different count. No one claims it is the true number of homeless individuals. And the count will neither represent how many people experience homelessness throughout the year, nor include every person who lacks a stable housing situation. But the homeless count is important, and if executed in consistent fashion each year, it can serve as an important socioeconomic indicator similar to the poverty rate, unemployment and even the tourist arrival numbers. SO HOW BEST to understand and interpret this number? The best way is first to divide it into its two major components -- the unsheltered homeless (those living on the beaches, in parks, etc.) and the sheltered homelessness. While we wait for the final estimate, we can already know one thing: The sheltered population has increased. Why do we know that? Because the state has opened three new shelters since the last count -- Kakaako, Lighthouse and Kalaeloa -- that now house about 600 people. Given these new facilities and the likelihood that all existing facilities remain essentially full, the sheltered population is likely to exceed 2,100 individuals, or about 600 or so more than the 2005 sheltered count. And as the state continues to open new homeless shelter facilities -- including the new 300-bed Waianae Civic Center -- the sheltered homeless will continue to rise. But this is not necessarily a bad thing, since it is better to have people living in shelters than on the streets. And if we further subdivide the sheltered population into two more distinct components -- individuals living in emergency shelters (Institute for Human Services, Kakaako) and individuals living in transitional shelters (Maililand, Onemalu) -- increasing numbers actually can be a sign of success. Well, currently out of the 2,100 shelter beds on Oahu, about half (1,100) are transitional units. Many of these units are no different from regular rental apartments. In fact, they are rental apartments. One could make a strong argument that individuals living in transitional shelters should not even be considered homeless. Many exceed the quality of public housing units or many of the shabby apartment complexes populating Honolulu. So, if the point-in-time estimate yields 4,000 homeless people on Oahu, remember about one-quarter of those individuals are already being adequately housed. And as we build more transitional shelters, the homeless point-in-time count will continue to rise, but again that doesn't mean we haven't made great strides in providing solutions. RETURNING to the second major component, the unsheltered population, it is now evident that this population is actually the key problem and should be of greatest concern. Again, two ways to measure it are helpful -- the total number of unsheltered people, and the percentage that this number represents among the total homeless population. In 2003 and 2005, that percentage on Oahu hovered around 60 percent, or about 2,000 unsheltered out of 3,500 total homeless individuals. New York City, with a very large homeless population (exceeding 30,000), actually has a very low unsheltered percentage of less than 5 percent. Los Angeles, on the other hand, estimates an extremely high unsheltered percentage, upwards of 70 to 80 percent. Rather than worry about the total number, Hawaii's goal in the next few years should be to reduce the unsheltered population to less than 1,000 and to reduce the unsheltered percentage to less than 25 percent. Don't worry so much about the total number, especially those in transitional units. By opening new shelters, we hope these beds (either emergency or transitional) will reduce the unsheltered population. Unfortunately, as exemplified with Kakaako, many of those living in the shelter did not come from the streets. Movement from so-called at-risk or doubled-up situations to the emergency shelter is too often the norm. Unsheltered people often tend to be different from sheltered people -- mainly, they don't like congregate living, rules and regulations, and are able to maintain their independence by surviving "on the streets." REMEMBER, the displacement of some individuals from unsheltered locations might only provide an opportunity for new dwellers. Planners and geographers will tell you that cities often develop carrying capacities for phenomena like homelessness. Finally, two last predictions about the count -- one is a certainty, the other a speculation. First, no matter what number is arrived at by this count, most advocates will maintain that it is still too low. The more bold prediction is that it also is likely that the unsheltered population has remained stagnant at about 2,000 individuals -- similar to 2003, 2005 and actually 1992. Despite the crisis of the Waianae beach parks, other Oahu parks might have witnessed decreases. Certainly, the closing of Ala Moana Beach Park has reduced the availability of places to live unsheltered. In addition, demand for some types of shelter appears to have slowed down the last few months. And believe it or not, homeless programs have housed many people, with providers working hard to keep them housed. The unemployment rate also has further plummeted, and actually housing is a little more available than it was a year ago. And then there is the carrying capacity theory. I COULD be wrong about the estimate; I hope I am not. For the sake of the work that the homeless service sector has done in the past year, it would be nice to see some progress or at least stabilization of the acuity of the problem. That doesn't mean there isn't much work to be done and much remaining need for funding. Success breeds success. Those in the homeless sector shouldn't be afraid to acknowledge it, if and when it happens. They might even find that they will get more support. So, when you read about the dreaded homeless count number, try to remember the upside and the downside it might represent. Michael Ullman is a researcher, nonprofit consultant and doctoral student in the School of Social Work, University of Hawaii-Manoa. He also is the creator of "Truly Dually," a musical about chronic homelessness.